Red Cross search & rescue corps (hjelpekorps) is the largest volunteer group within the Norwegian rescue service. Its main task is to assist police in search & rescue operations for example if someone goes missing, in case of accidents and natural disasters. The team gives medical support during various events in the community for example festivals & concerts, First Aid instruction, and in some locations, it also gives ambulance services. All activities carried out by the team are based on the needs of the local area. Some of the volunteers are youth who are always ready for action. Impressive, right? We were around fifteen people in the bus who needed to be rescued. Four more casualties were in the other two cars outside. I was screaming the loudest for help. At least I could, and I was glad that help had finally arrived. I had a broken jaw and was bleeding profusely on my arm. A firefighter said “Vi hjelper deg” (we will help you) as he walked past me to help a lady that was silent near me. After a number of the casualties had been helped out of the bus, another firefighter approached me, this time focusing all his attention on my injury. “hallo, kan du stå og er du i stand til å gå?” he said. At the time I did not realize that it was a question leave alone knowing what he was asking but I was swift to reply, “Unnskyld, jeg forstår ikke. kan du gjenta det på engelsk? Jeg snakker bare litt norsk.” (am sorry I do not understand, can you repeat in English) This I knew, thanks to the Norwegian classes. Oh! excuse me, are you able to stand and can you walk? he asked. I could and so helped me off the bus and another one attended to me as we waited for the ambulance. Last week, Akershus Røde Kors hjelpekorps team joined the activity “Fire on the bus” which was organized by the fire department. It took place somewhere in Hellerudsletta, Skedsmo. It was a drill aimed at testing firefighters’ skills and prowess to competently respond to a road accident. Contrary to the popular belief, fire fighters not only respond to fire related cases but they also mitigate hazards during medical emergencies, personnel rescues and natural disasters. 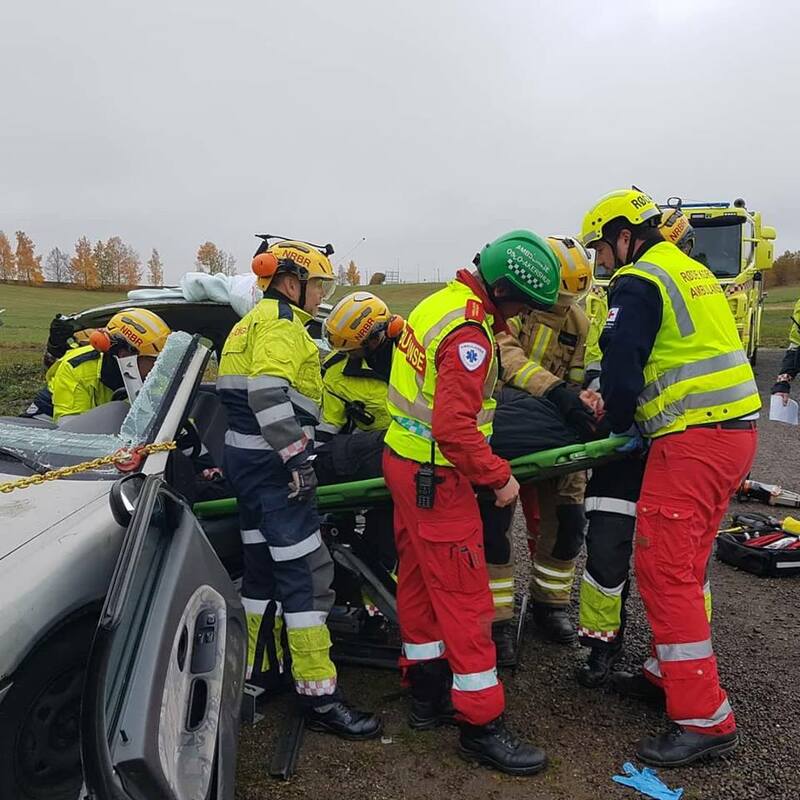 Participating in this drill was a fantastic experience for me because, in addition to having fun, I got to see an activity by fire department in cooperation with hjelpekorps team in Akershus. Do you know why they did not save me first despite my screaming and shouting? They did not start with the guy with the cut on his head who was also shouting for help either. Do you know why they first rushed to the quiet, immobile lady next to me? Well, if you don’t, this could be a good time to enroll for that First Aid course in Red Cross. You will be amazed by what you learn. The next time you see a fire fighter or a Røde Kors Hjelpekorps volunteer, give them a thumbs up if you can. They are indeed unsung heroes whom with passion,devotion and determination risk their lives to save other lives.